The incidence of HIV infection is increasing rapidly in the United States of America and in Central Europe. Data on the increase in the number of malignant tumours in HIV infected individuals are incomplete. Kaposi’s sarcoma is part of the acquired immunodeficiency syndrome (AIDS), and the variant in AIDS patients is more aggressive than the classical one. Nevertheless, progression of Kaposi’s sarcoma is only rarely limiting in the course of AIDS. If treatment is indicated, radiotherapy is in many cases effective. Non-Hodgkin lymphoma is also closely associated with HIV infection. Typical features of these lymphomas are the highly malignant morphology with a B-cell phenotype, the high rate of extranodal localisation (CNS) and the high proportion of advanced stages (III and IV). It is possible that the incidence of other tumour types such as Hodgkin’s lymphoma is also increased in HIV-infected patients. 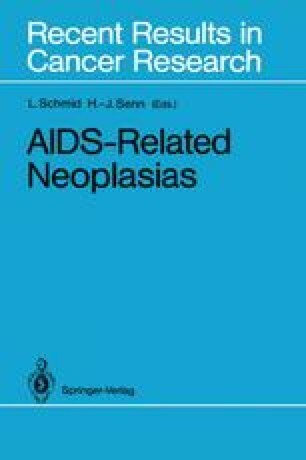 An acceptable rate of complete remission of highly malignant non-Hodgkin lymphoma in HIV-positive individuals can be achieved with aggressive combined chemotherapy. Unfortunately, the data presented by various authors show very short median survival times (5–6 months). Patients die from opportunistic infections as well as from progression of the tumour.